I purchased this carousel a while ago from Stampin' Up! and love storing my SU inks and refills in it. However I've never had it actually spin smoothly. I think I need to oil up the bottom spinny thingy (thats the technical term lol). 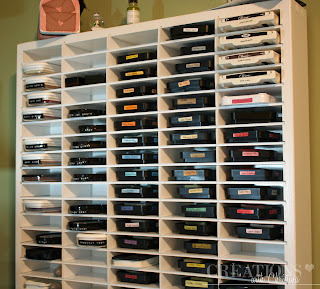 For my Tim Holtz Distress inks, Paper Trey Ink and Chalk inks I use this wall mounted storage system from Organize More. The one I have hold 80 ink pads, but they have many other styles. 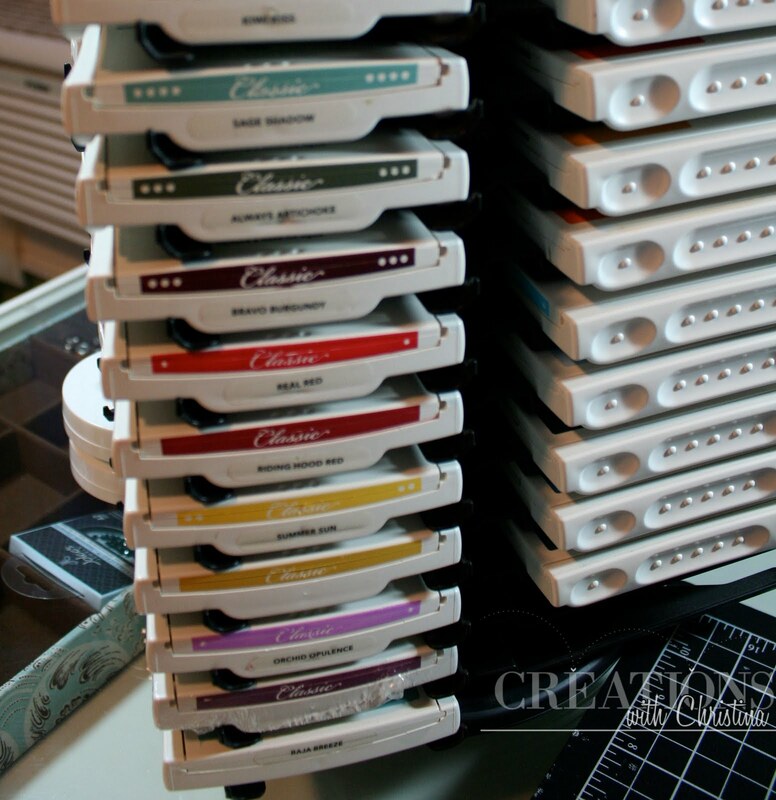 They also carry other types of storage systems as well (Ribbon, Stamp, Cricut etc). How funny! I was in Hobby Lobby yesterday looking for some way to store my ink pads. I finally have enough to need some way to store them! Love your ideas. I had the same issue with my SU carousel. I found an inexpensive lazy suzy and put my carousel on that...spins like a breeze now. I organized in April or May and everything is a mess again!! How do you keep everything neat??? I have the SU holder too and I don't think I have mine together right as it too turns terrible. My friend also has one and it is great.... go figure. I am still stacking mine in boxes with compartments. I don't have as many as most crafters (25ish), so this still works. I also have this clutter thing, I don't like looking at everything at once. I know, I need to get over that! Love your blog, visit it everyday! My Stampin Up carousel doesn't turn smoothly either, so, I went to Target and bought a lazy susan and now it spins just fine. The lazy susan was about $5.00 I think. Works great! I have very much enjoyed Storage Tip Tuesday. Love the ink storage spinner. I am very busy today and don't have time to read the comments but will read them tonight. I store mine on a shelf as I do not have my own scrapping space right now. I keep telling my 23 year old daughter her room is mine when she moves out. Thanks for the tips! Now, how do you store the stamps? That is my next obstacle. Thanks for the link to Organize More. I love organizing gadgets. My wonderful hubby ordered this for me two years ago for my birthday. While it's costly, I love it! I have ink all over the place... this will be a great thread. I do have my TH Distress inks on a little wall shelf that I picked up at a yard sale. It has (3) shelves and I stack and sort by color family. Thanks Christina! I'm going to have to check out that organized more. I wonder if SU stamps will fit in there too? Congratulations on the followers. You are so talented you should be at a million! Try WD40 on your turntable. My husband laughs at me beacause I use it to solve all my household problems. It works! 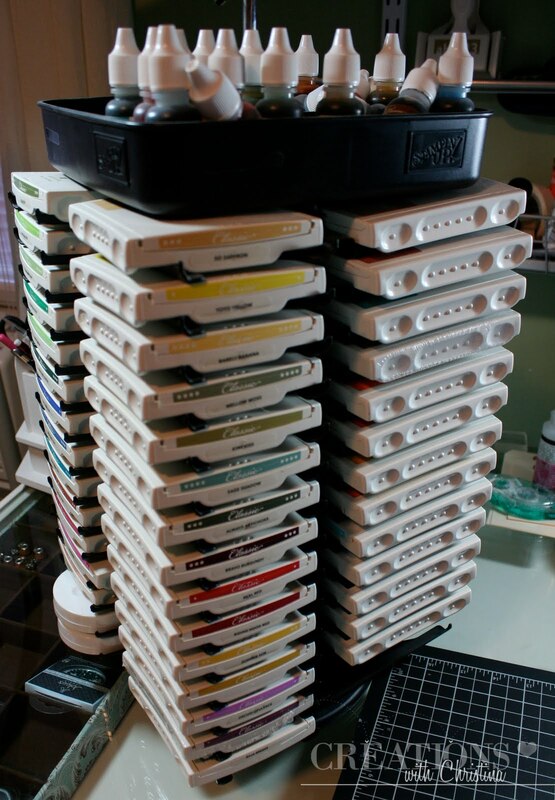 Wow - quite the ink supply. Makes me envious. I really need to do something with my inks. I have a lot of different brands and shapes and sizes and don't know what to do with them. Unfortunatly I don't have any room for a wall mounted storage unit. Don't have any drawers either. Anyone have any great ideas? Thanks for sharing your ideas Christine...I am in very much need of getting organized. My ink pads are stored in a tiny crate type thingie...need a better system because they're stored on the sides and fall like dominos when I remove a few. I think the storage tips would be a great thing for all of us to share. I don't have a lot of inks right now, but I'm getting more, a couple at a time. So I'll be needing a different storeage thingy to hold them all. Another technical term. I think if your spiny roundy thing doesn't spin right it's probably a bad bearing. I don't know if it's fixable by we scrappers, but it never hurts to ask. Maybe it's just a defective one? Wow, 2,000! holy stalkers batman! lol I've been following for severl months now. Every day since you were doing the Wild Card series! I feel like I could sit down and just chat like we'd know each other for a long time. Of course it's different for you. That's a whole lot of people to remember! I'd never do it! I have trouble with 12 or 15! Hi Christina, I really keep thinking about getting the SU carousel but I also think about all the ink and stamps I can buy with that money. So I went to Target and spent $20 on a good lazy susan and put my stamps in boxes (the old ones that the stampin up ink sets use to come in.) It holds four boxes with extra room, and it spins great. A lot of people have said the SU one doesn't spin well. I like what Anonymous said about them flying off the rack. That makes sense. If they didn't have to lay flat I would stand them up on their side in a drawer I will probably end up getting something else but I had to try cutting cost first. That is what I do and end up spending more in the long run, well sometime! Oh my goodness Christina. I just went to Organize More. Wow their stuff is wonderful and reasonable. Now to find some wall space. Thanks so much. I really love the these Tuesday Tips. Thanks so much for doing this it is a wonderful idea! I like your ideas, I have mine sitting on my desk and they are so hard to work with. I have tried plastic storage bins but they just don't work. Thanks for sharing your ideas. Thanks for the link to Organize More. I ned to give them some business. I think all of these storage tips are great. 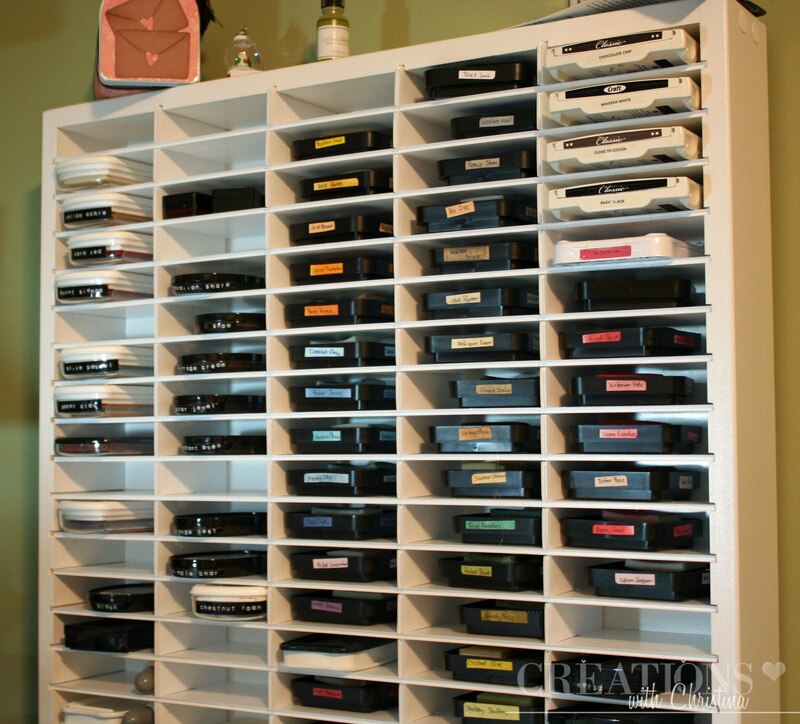 I agree with someone elses comment, how do you store your stamps. Most of mine are the old wood mount. Thanks for the link to the organize website. I am always looking for better ways to store all of my stuff. 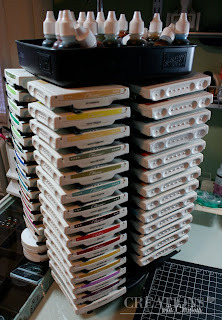 I only have a handful of inkpads and I do need something better to store them in. Quick question - does the SU ink carousel hold other brands of ink, too? Hi Christina, unfortunately OrganizeMore will not ship to Canada. Do you know of any companies that sell something similar to the 80-pad unit? Thanks in advance. P.S. Your e-mail contact form would not work for me. 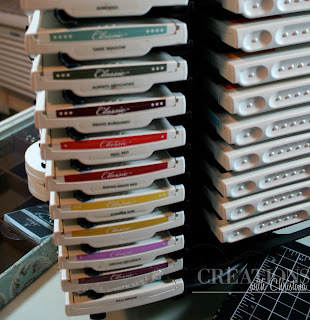 Which stamp pad would you recommend the most for general stamping? I am somewhat new to stamping and I am enjoying it SO much. I only own the clear acrylic stamps. Any specific suggestions?